I can see the reflection of the angel in the eyeball, but I cannot read what the t-shirt says. This picture is just perfect for my mood right now. I’m a biology teacher and it is engaging, not really gross or anything. 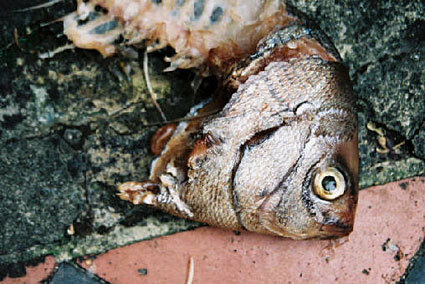 The photo has color, multiple implied stories, and since fish are so brainless, little (but not no) implied suffering.